When you travel to Panama for the first time, you're probably curious about what Panamanians eat and drink. Because of Panama’s diverse Spanish, American, Afro-Caribbean, and indigenous influences, Panamanian cuisine ranges from the internationally known to local exotic foods. You'll find regional variation in Panama. While on the coast, you'll find dishes made with local seafood, coconut, and tropical fruits. In the interior areas expect more beef, pork, and chicken and root vegetables served with sauces typical of Latin American fare. Panama breakfasts often contain deep-fried corn tortillas heaped with eggs and other delicious components, including fried meat. If your heart can’t handle it, don’t despair—fresh fruit, eggs, and toast are easy to find all over the country. American style breakfasts are also offered in most restaurants. And of course, a cup of Panamanian coffee is a must. A typical Panama meal usually includes meat, coconut, rice and beans, accompanied by local fruits and vegetables like yucca, squash and plantains. You usually won't see much in the way of salad greens. As with Costa Rica cuisine, this platter is often called a casado (a “married”). On the other hand, the food of Panama’s islands and expansive coasts is vibrant with fresh seafood and tropical embellishments, such as mango and coconut. Sancocho: A Panamanian stew, packed with meat (usually chicken) and an assortment of veggies. Empanadas: Savory corn or flour pastries filled with meat, potatoes and/or cheese. They are sometimes served with homemade tomato sauce. Carimanola: This is a fried yucca roll stuffed with meat and boiled eggs. Tamales: boiled pockets of corn dough, stuffed with meat and served in banana leaves. Even if you tried these in some of the other countries of the region, ask for them again in Panama. Each country has its own recipes and food traditions. Interesting side dishes complement the fish and meat. Locally available traditional foods like yucca and sweet plantain are used. Yuca frita: Fried yuca root accompanies many Panama meals, serving (and tasting) like tropical french fries. Plantains: In Panama, plantains come three ways. Patacones are salty fried green plantains cut crosswise; Maduros are mature fried plantains (slightly sweeter) and Tajadas are baked plantains cut lengthwise and sprinkled with cinnamon. They are all delicious. Gallo pinto: This is basically rice and beans that are often mixed with pork (unlike Costa Rica gallo pinto). Ceviche: This is chopped raw fish, shrimp, or conch mixed with onions, tomatoes and cilantro, and marinated in lime juice. It is served with fresh tortilla chips and is popular in every coastal region. 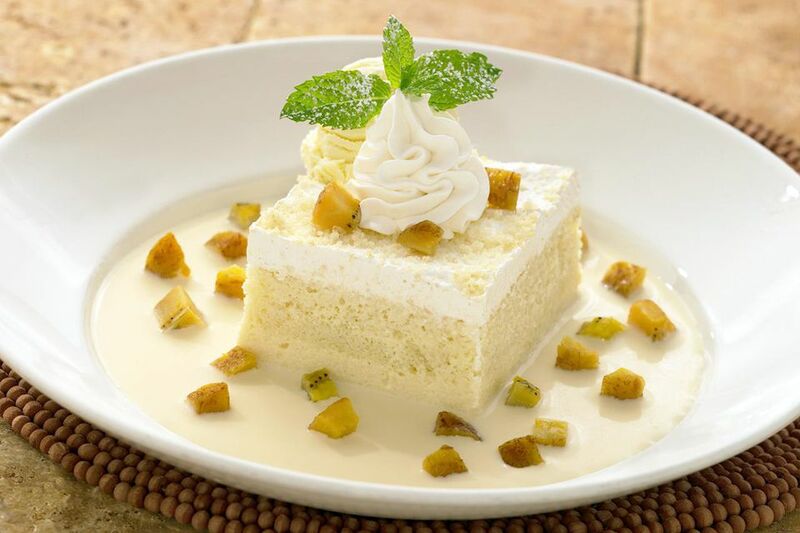 Tres Leches Cake (Pasel de Tres Leches) is popular in many countries. It is a cake soaked in three kinds of milk, including evaporated milk, sweetened condensed milk, and cream. Raspados are Panamanian snow cones, topped with sweet syrups and condensed milk. Sometimes you can even ask for some fruit to be added on top. Panama beer brands are Panama Cerveza, Balboa, Atlas and Soberana. Balboa beer is a darker stout-like Panama beer, while the others are lighter brews. Beer in Panama are as cheap as $0.81 US in the supermarket, and between one and two dollars in restaurants. Imported beer is more expensive. If beer isn't strong enough for you, try some Panama seco. This is a fermented sugar cane liquor. You can mix it with milk to lessen the bite. Panama isn’t the cheapest Central America country. Along with Costa Rica, it tends to be the most expensive. That is because all costs are in American dollars (Panama’s national currency), so no calculations are necessary to determine the price of your Panama meal. However, even so, it still isn't as expensive as destinations in Europe and is, overall, 25 percent cheaper than in the U.S. If you’re looking to save money, sample the most authentic food in Panama at a fonda, or roadside stall.